The above printable metro map is the English-Chinese Version. See the English Version of Shanghai Metro Map and Chinese Version of Shanghai Metro Map. Line 1: Xinzhuang - Fujin Rd. Line 3: South Railway Station - North Jiangyang Rd. Line 4: Inner Ring:Yishan Rd. 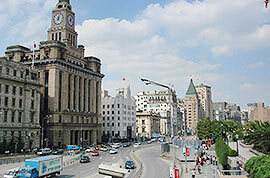 - Shanghai Railway Station - Century Avenue -Yishan Rd. Outer Ring:Yishan Rd. - Century Avenue - Shanghai Railway Station - Yishan Rd. How can I go by metro from Shanghai hongqiao railway station to national convention center? Take metro line 17 from Hongqiao Railway Station to Zhuguang Road Station, Exit 1. After arriving, walk east around 550 meters to find the destination. how can I travel from hongqiao railway station to shanghai pudong airport by metro? First, take the metro line 2 at the Hongqiao Railway Station and then get off at Guanglan Road where to transfer to the metro line 2 East Extension Field and get off at the airport metro station. The whole ride needs about 100 minutes and CNY8 per person. Another way is recommended to you. You can first walk about 10 minutes to the Hongqiao Hub Transportation Center where you can take the direct airport bus line 1. The whole ride needs about 65 minutes and costs about CNY30. please help me I want to go to Shanghai from Suzhou North Railway Station to Huangpu, Zhejang Rd. You can take a high speed train from SZ North Station to SH Hongqiao Station and then take the Metro Line 2 to East Nanjing Road. Get out of the Exit 1 and walk about 600m, you can get there. From Shanghai south railway station I have to go to YAN AN XI LU, which metro line shall we take? You can take the Metro Line 3 to Hongqiao Road Station and transfer to Metro Line 10. Get off at the Yili Station and get out of Exit 4, then walk about 700m you just arrive there. You can take metro line 2 first from the airport to Peoples square and transfer there to take the metro line 8 to Macrocosm Station. Get out of the exit 1 and walk about 300m you can get the hotel.